Forms Manager tool can be found in the Map Editor application under the Tools tab. Its purpose is to enable creation and defining Mobile Data Collection forms. 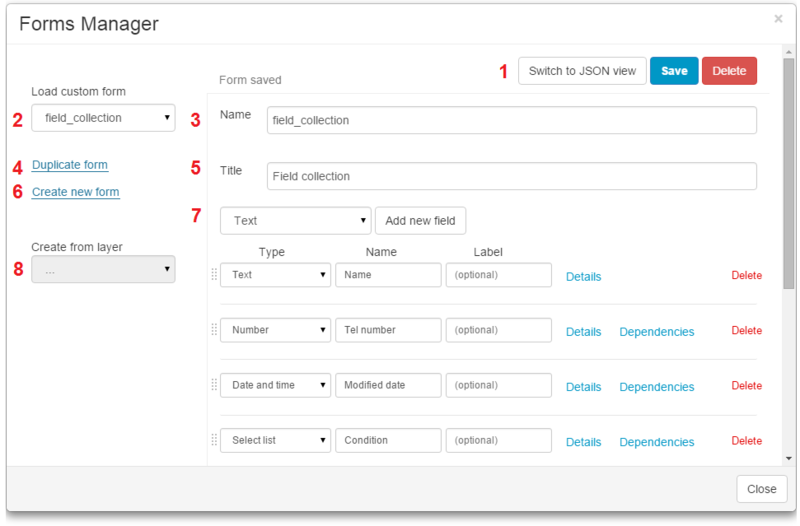 Load custom form – you can load existing custom forms from a drop down menu and make some changes on it. Duplicate form – if you wish to make some changes to existing form, but keep the old structure as well. Form Title – visible to Mobile Data Collection users. Create new form – defining form from scratch. 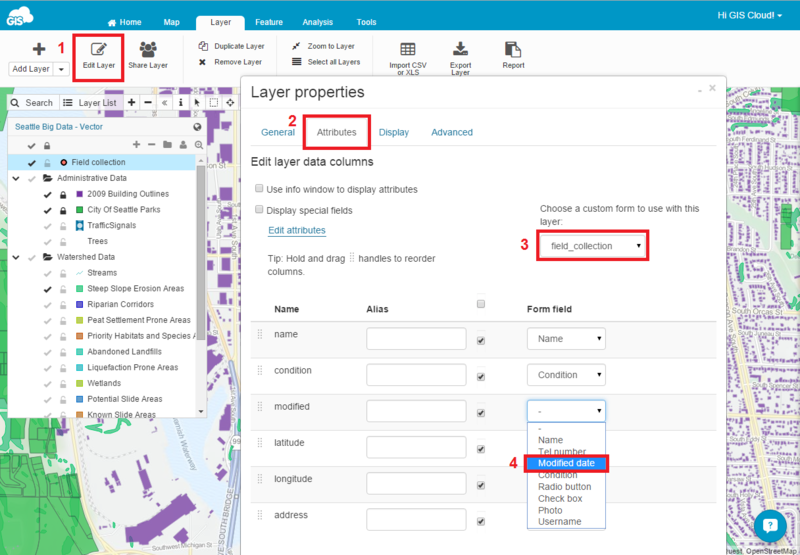 Create form from layer – automatically add fields with same definition as in the layer you have in current map. Please note that layer is not automatically connected with layer if form is created from layer. It is necessary to connect form and layer. Note: layers must be added to the map from the Database to allow creating form from a layer. Click Create new form button. Write a form name. Optionally you can add Form Title. Add fields by choosing from the drop down list. 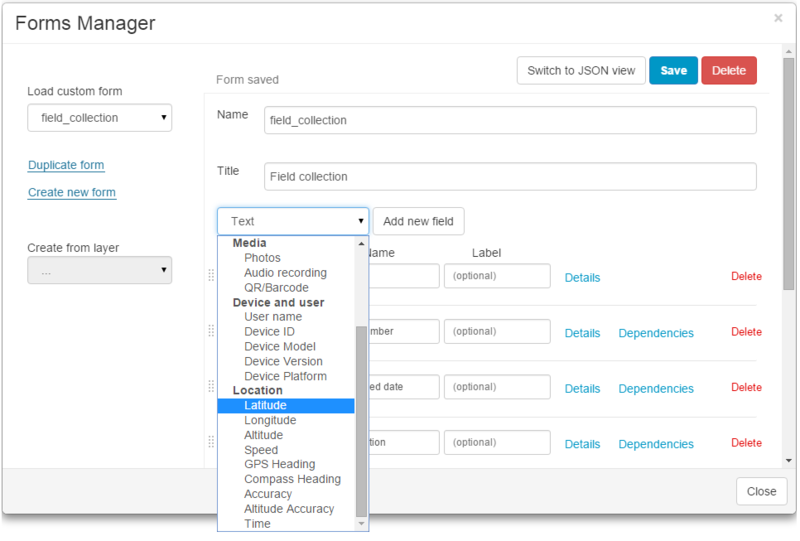 To collect data with the Mobile Data Collection, database point layer has to be connected with the form. Note: if you are creating a project with the Mobile Data Collection Portal, form is automatically connected with the layer. Open Layer Properties by clicking on the Layer tab and Edit Layer button. Choose a custom form to use with the layer from the drop down list. Join each form field with corresponding layer column (e.g. “address” column in the form with “address” form field. Note: it is really important that you connect each form field with column otherwise collected data will be lost.